My son Charlie recently finished his very first year at school and wanted to give Christmas presents to his teachers. Since I’m raising him properly, cough, he knows that the best things in life are hand made! 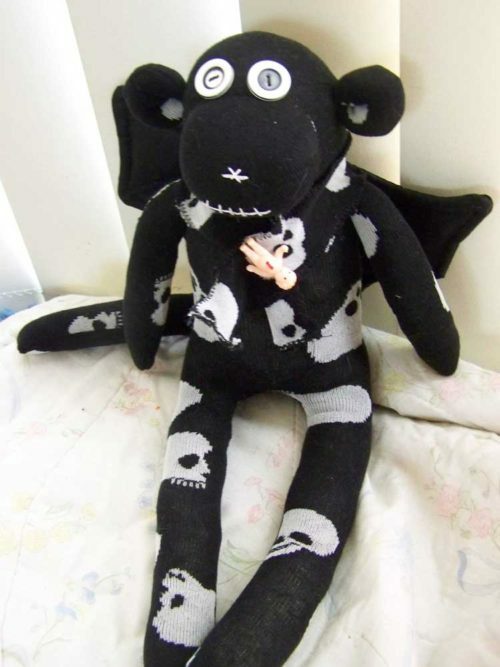 Of course, being me, they had to made at least partly of wool and they just wouldn’t be as special if Charlie wasn’t involved in making them. I find weaving is a great textile technique for children. 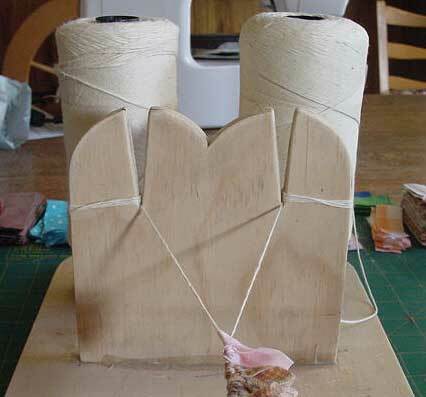 They can make something quickly, try different techniques as they get older and you really only need a board with some nails or a piece of cardboard to get started (if you have older children a pvc pipe loom is a great option as well. It’s faster to weave on and more versatile). The first thing we made was a blanket using bulky weight yarns (or several strands together to make up a bulky weight) on a Martha Stewart Loom. 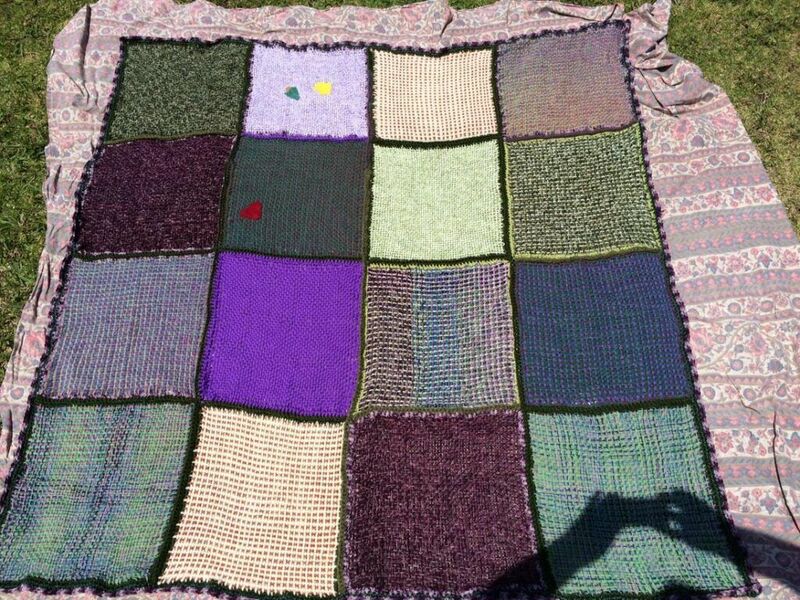 I had 13 of the squares already made so we only had three to go, which was great because I only had 3 weeks to get everything finished. Charlie wove the bright purple square almost entirely by himself and added some needle felted decoration using the cookie cutter method. I’ve read that this loom isn’t very good for knitting but I love it for weaving. Charlie and I wove our squares using the weavette or zoom loom continuous thread technique on the loom with the largest square configuration, which means using all of the straight pieces in the kit. 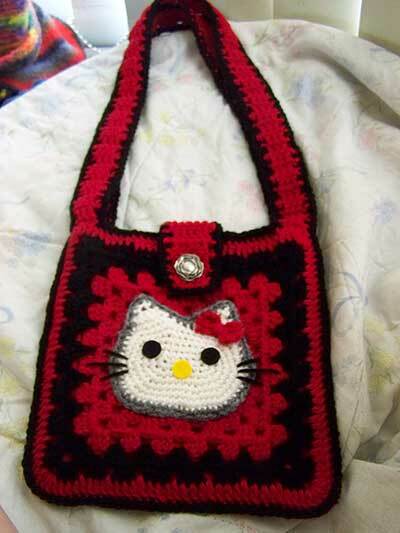 I fudged the corners but once they’re crocheted together you can’t tell so it really doesn’t matter. For his other teacher we made a scarf on a rigid heddle loom. The yarn is dk weight handspun merino and alpaca and, as you can tell, I didn’t have time to sample the yarns together and the merino shrank in the wash, while the alpaca didn’t. Oops. Considering how much I had fulled the merino, I really didn’t expect it to shrink but there you go, it did. His teacher loved it anyway :). I’m thinking of weaving some yardage using the rest of the purple and blue/green but I’ll have to search the stash for some other colours to put in to make up enough for either a winter skirt or a jacket. Probably a skirt as a plaid jacket would be a bit too, um, daring, I think. 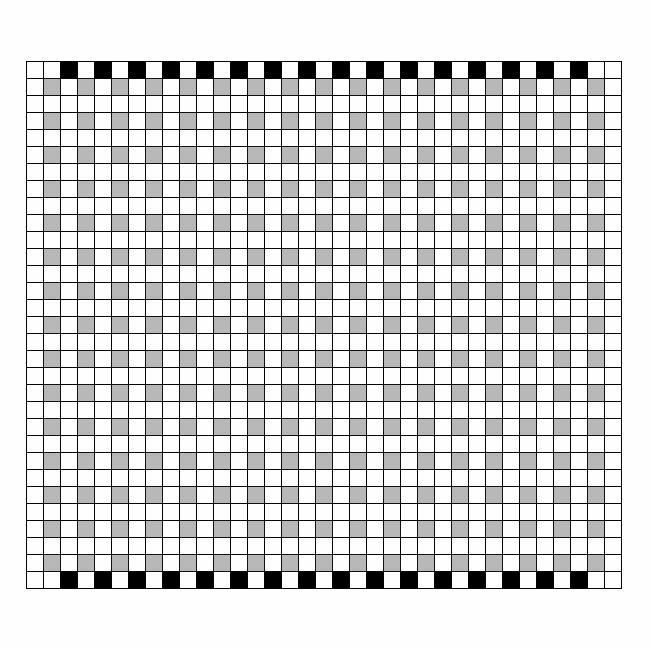 Update: I’ve moved the Weavette/Zoom Loom chart to a page and have added a pdf file for you to download and colour! This is a blank chart that I made for making up my own designs. Please feel free to use it for personal use only. You may use it to make charts to share for free. Leave a comment if you’d like more instructions on how to use it. I don’t usually put tutorials straight in the blog but I couldn’t wait to finish my rug to show you this! 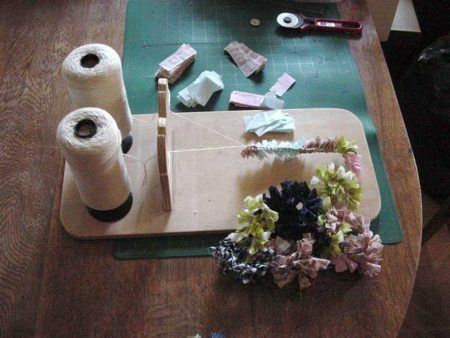 About 6 months ago I saw some vintage rag rug looms on ebay. Postage from the US to Australia was prohibitive because they were so heavy, so I copied down the measurements in the description and my Dad made me one. It’s about 20 inches long with a cup hook at the front for tensioning the warp, two posts at the back for sitting your spools of warp on, and a perpendicular piece of wood with two slits in it for keeping the warp tensioned and at an angle so you can get your hands underneath for speedy knot tying (for the sake of this tutorial I’m going to call this the “tensioning post”). If you’re a woodworker please feel free to make and sell these. We need to keep the old crafts alive! 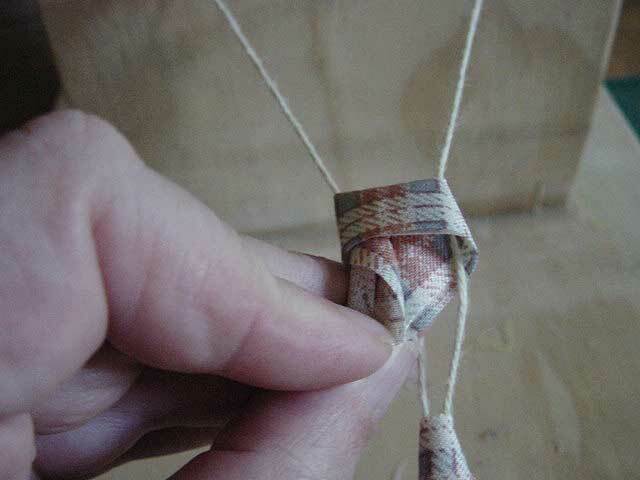 Here’s how to make the ghiordes knots. (I have read the ghiordes rhymes with forties, but I’ve never heard anyone say it out loud)! 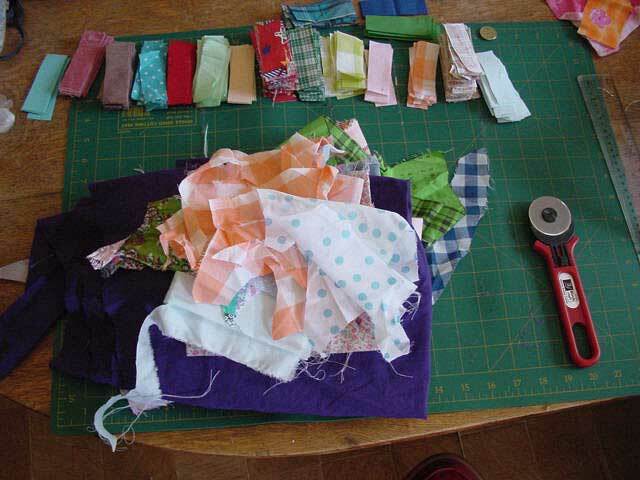 First, cut your strips of fabric. For my first try I have cut them 1 x 3 inches. I’m using fabrics that are mostly cotton that were left over from a Suffolk puff quilt that I made last year. (I’m going to experiment with other fabrics later on). 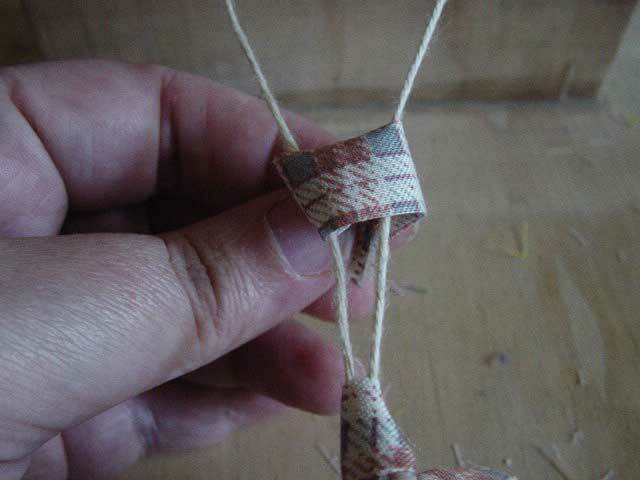 Tie your two warp ends together and put the knot in front of the cup hook. Pull the warp tight, thread it into the slots on the upright bit of wood and make a few loops over the outside edges to keep it tight. Take one of the strips of fabric and fold it in half lengthwise. Hold it across the top of the warp. (I usually make knots with two hands but one hand was holding the camera). Fold the ends to the back, around the warp threads. 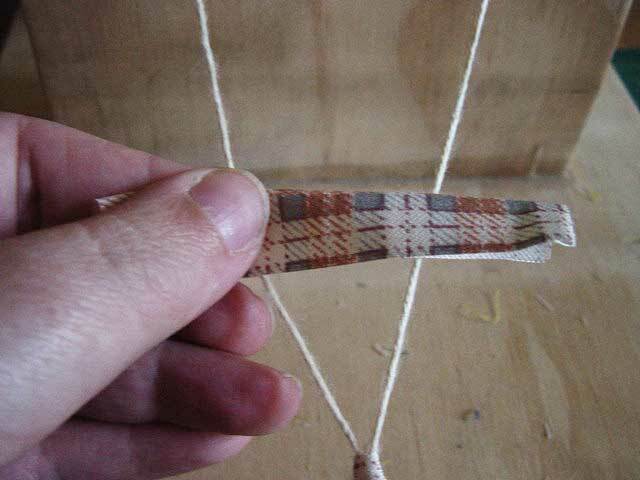 Pull the ends to the front, between the two warp threads. Use the ends to pull the knot down towards the cup hook. As you add more knots, keep pulling them down towards the ones already formed as you pull them tight. This is what a length of finished knots will look like. When you have made a lot of knots it will become difficult to tighten new ones because the warp will want to pull them apart again. When this happens, untie the warp threads from the tensioning post, take the other end of your warp off the cup hook, move it along and retie the warps on the tensioning post. The last ghiordes knot you made should be in front of the cup hook. Keep making knots until you run out of warp or it’s long enough. Whichever comes first. To make a rug you twist your length of knots into a large flat spiral, keeping the pile on one side. 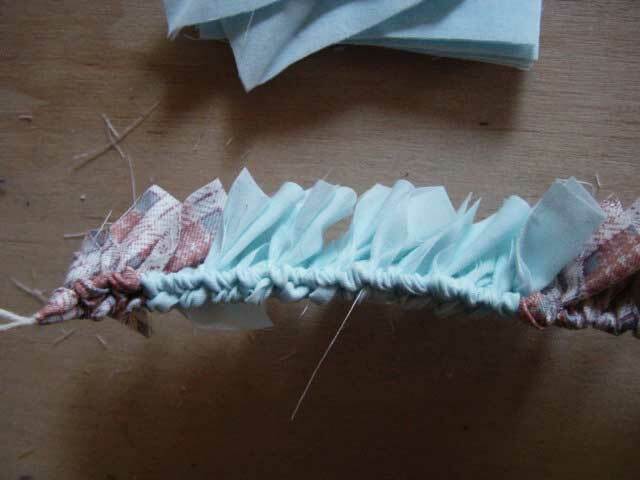 Stitch the fabric together on the back with a strong thread. I don’t have any tips for this part yet as I haven’t got that far. You can also use these knotted lengths for other things. I’m going to try making some with 6 inch long strips of fabric, then trap it in the seam of a cushion for a rag strip fringe. I also made a long piece with yarn. 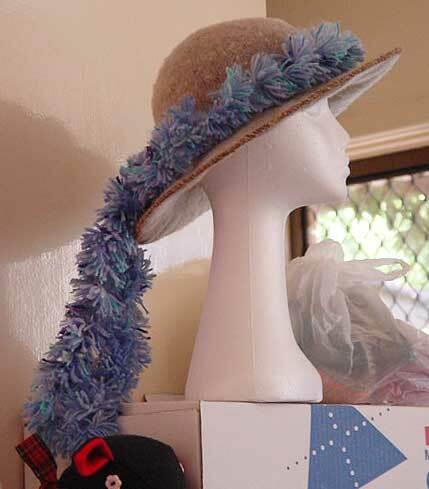 I could see making three long strips and tying them together at regular intervals with another piece of yarn to make a big, thick, fluffy boa.